A new Pew Research Center survey report finds high levels of concern about religious extremism among Muslims in the North Caucasus area of Russia and the neighboring Central Asian countries of Kyrgyzstan and Kazakhstan. The survey also finds that few Muslims across the region support the use of violence against civilians in the name of Islam, though there is somewhat more support for suicide bombing and similar violence among Muslims in Kyrgyzstan than in Russia or Kazakhstan. The survey, conducted among nationally representative samples of Muslims between October 2011 and February 2012, finds that more than four-in-ten Muslims across Russia as a whole are either very concerned (20%) or somewhat concerned (26%) about religious extremist groups in their country. 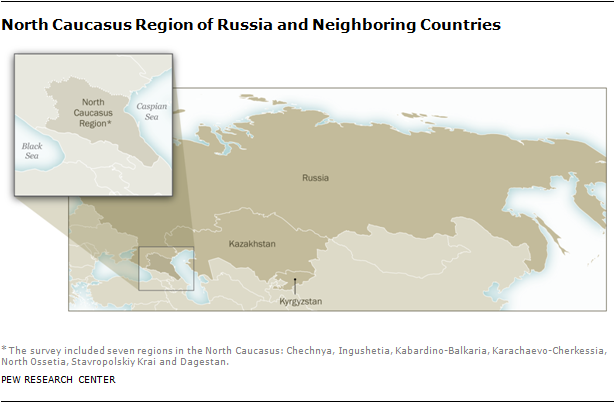 Among Muslims living in Russia’s North Caucasus region – which includes Chechnya, Dagestan and five other Russian jurisdictions – more than half say they are either very concerned (32%) or somewhat concerned (25%) about religious extremism. In Central Asia, about six-in-ten Muslims express concern about religious extremism in Kazakhstan (28% very concerned, 35% somewhat concerned) and Kyrgyzstan (29% very concerned, 33% somewhat concerned). Moreover, the survey shows that much of this concern focuses on Islamic extremism. Very few Muslims in Russia say they are concerned mostly about Christian extremism (1%), while 20% say they are worried mostly about Islamic groups, and 21% are concerned about both Muslim and Christian groups. In Russia’s North Caucasus region, many more Muslims say they are worried mainly about Islamic extremists (36%) than say they are worried mainly about Christian extremists (2%) or both (18%). Similarly, Muslims in Central Asia generally express more concern about Islamic extremism. In Kazakhstan, 46% of Muslims say they are worried mostly about Islamic groups, while virtually none say they are concerned mostly about Christian groups and 12% say they are concerned about both. In Kyrgyzstan, 32% are mostly concerned about Islamic groups, compared with 5% who are mostly concerned with Christian extremism and 20% who express concern about both. The Pew Research survey also asked about attitudes toward suicide bombing and other violence against civilians in the name of Islam. More than eight-in-ten Russian Muslims (86%) say acts of violence that target innocent civilians are never justified as a means of defending Islam against its enemies. Among Muslims in Russia’s North Caucasus, upwards of nine-in-ten (93%) think such acts of violence are never justified. In Central Asia, violence against civilians also is widely rejected. Most Muslims in Kazakhstan (93%) and Kyrgyzstan (66%) say suicide bombing and similar forms of violence are never justified. Across Russia, Kazakhstan and Kyrgyzstan, few Muslims say acts of violence targeting innocent civilians are justified. No more than one-in-ten Muslims in Kazakhstan (2%), Russia (4%) or Kyrgyzstan (10%) say violence in the name of Islam is either “sometimes” or “often” justified. 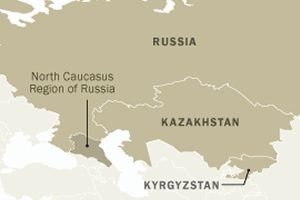 The Pew Research Center also has data on the religious demography of Russia, Kazakhstan and Kyrgyzstan. As of 2010, there were an estimated 14 million Muslims in Russia, comprising about 10% of the country’s total population, according to estimates from the Pew Research Center’s 2012 Global Religious Landscape report. Russia has more than 100 million Christians (73% of its total population), while the religiously unaffiliated number about 23 million (16%). As of 2010, there were more than 400,000 immigrants born in Russia living in the United States. Kyrgyzstan’s Muslim population numbered nearly 5 million (or 88% of its total population) in 2010. There also are more than half a million Christians (11%) in the country. Nearly 10,000 people born in Kyrgyzstan have immigrated to the U.S. during the last 20 years. Kazakhstan’s Muslim population numbered more than 11 million (70% of its total population) in 2010. There also are approximately 4 million Christians (25%) and about 700,000 religiously unaffiliated people (4%) in Kazakhstan. There are more than 20,000 immigrants born in Kazakhstan living in the United States.